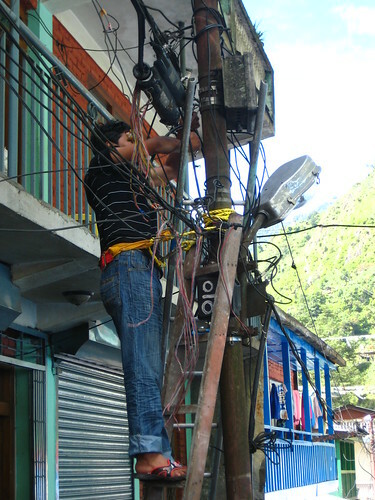 They don’t have the whole “electricity” thing figured out yet in Nepal. 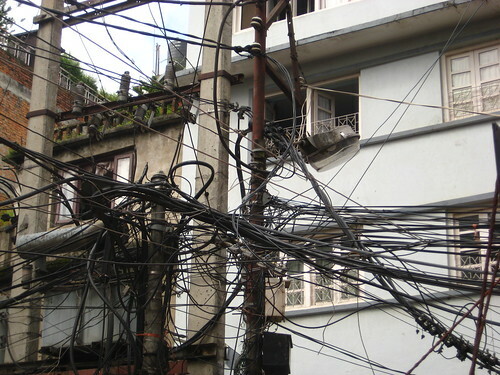 The power lines here are a tangled mess of coroded wires, hanging like cobwebs, loosely strung in every which way with no semblance of a plan. The guy in the photo above is working on the power lines, apparently ignoring all the little streams of sparks spraying out of the contacts like miniature fireworks. He’s propped up on a rickety wooden ladder, running wires into a live telephone pole with no safety equipment. No rubber gloves. No hard hat. No uniform. No problems. 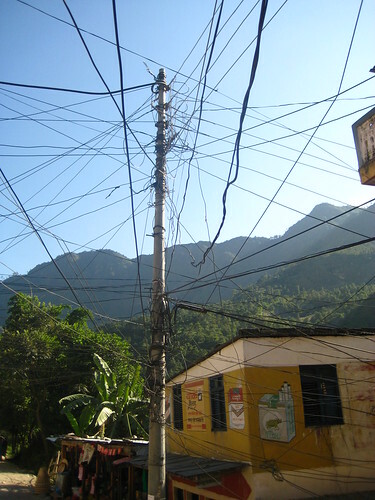 But then again, it’s probably not the best system when presumably untrained locals just walk over to the village hub and string up their own power lines. Nepal has a severe power deficit. Almost all of the power generated in Nepal is hydroelectric, coming from the steep rivers running down from the Himalayas. Hydroelectric power, specifically the water flows that generate it, is notoriously inconsistent. The slightest dry spell cuts power generation significantly. Even in a good year, the state-run utility company is able to generate only HALF the electricity needed to satisfy demands. A significant amount of electricity is also piped in from India, but it’s still not enough. Thus, the blackouts. Every single day, the power goes out for a few hours, usually 4 hours at a time. This isn’t an accident — it’s intentional. The government cuts the power on a set schedule out of necessity. As a growing country with constantly growing energy demands, the power deficit just continues to grow. At certain times of year, especially in the middle of winter when hydroelectric generation is at its lowest, the power outages last for as long as fourteen hours per day. With most people in rural areas living with extremely limited or entirely without power, there isn’t much incentive to extend the grid to more people. 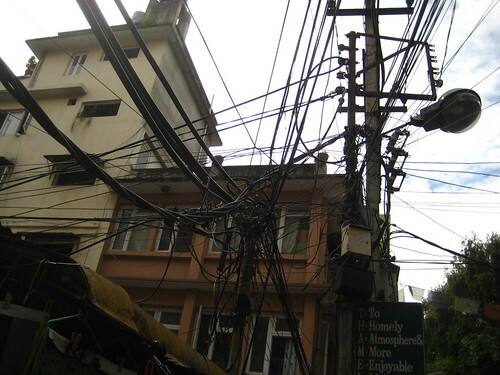 This lack of electricity staves off economic development and keeps Nepal as one of Asia’s poorest countries. As a tourist, the power outages don’t affect me so much (other than small inconveniences here and there, and the eerie feeling I get when all the lights and sounds suddenly die in the middle of the day). But I suspect it would be a constant hassle if I were trying to run a business. Backup generators can only go so far. haha Do you think mixed martial arts will take over Traditional Martial Arts? If some one needs to be updated with latest technologies therefore he must be pay a visit this website and be up to date daily. You are loosing a lot of traffic. You need hi PR backlinks to rank in top 10. Great website. Plenty of useful information here. I am sending it to some buddies ans additionally sharing in delicious. And certainly, thannks on your sweat! Adam utilizes an enhancement thhat enables hiim to shoot taer darts from his knuckles.